I have cleaned out my sewing space and I have a couple of WIP boxes that are empty and was beginning to think about looking around for a new project and then some how (well I was blog hopping) I stumbled across this quilt along. It is going to be a leisurely start with Xmas and all. There is just something about this design that has attracted me to it. Now to choose the fabrics. or my stash of Pure fabrics for a more masculine feel. I do wish you wouldn't find such beautiful quilt alongs - now I want to do this one too - but unlike you I have to keep buying empty project boxes rather than emptying the ones I have - thank you! You certainly did have a productive FNSI. I couldn't join this one as two of my chikdren and DH have been in Sound of Music. Only finished last night. 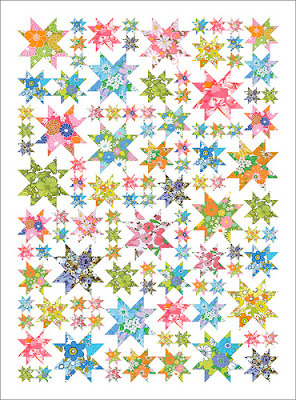 Thanks for the tip on the stars QAL - absolutely beautiful.